Just click the logo to visit the website of these great companies and view their catalogs. Delta® offers a wide range of quality products for the kitchen, bath and more. Use the Faucet Finder to select your style and finish preferences, and find the faucet that fits your personal taste. Moen's distinctive collections of kitchen faucets, bar faucets, kitchen sinks and accessories are designed with style and function in mind, to make your time in the kitchen a little easier. GROHE, today, is recognized as one of the leading faucet brands used in custom homes and upscale remodeling projects. This site focuses on our latest products as well as contains information on how to contact us, locate a select showroom, and our relationship with the environment. Need help selecting KOHLER products? 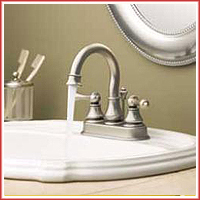 We'll provide step-by-step assistance for selecting the right faucets and fixtures for your project. Planning for a new bathroom or kitchen? Whether you are building a new home or remodeling, American Standard can help get you started. Before you begin, we have some information to help make your home project a little easier. We are State Industries, and our goal is to provide an abundant supply of dependable low-cost hot water, wherever it's needed. Our Expert's Choice residential and commercial water heaters, expansion tanks and pump tanks are designed for installation and service by professional contractors only. Liberty Pumps has been a leading manufacturer of pumps since 1965. Our contractor-quality products include sump pumps, sewage pumps, effluent pumps, pre-assembled sewage packages, drain pumps, and other pump products and accessories. All Liberty products are manufactured in a highly efficient J.I.T. environment that assures the highest quality and quickest response possible - and we back our products with a 2 YEAR WARRANTY! Our customer service and sales staff is dedicated to providing the answers you need for your specific pump application. In-Sink-Erator is the world's leading manufacturer of Food Waste Disposers and Instant Hot Water Dispensers. In-Sink-Erator offers a full line of disposers, so there's one which is just right for every home and every lifestyle. They are available in a wide variety of motor sizes and capacities, from retail stores and through plumbing contractors.